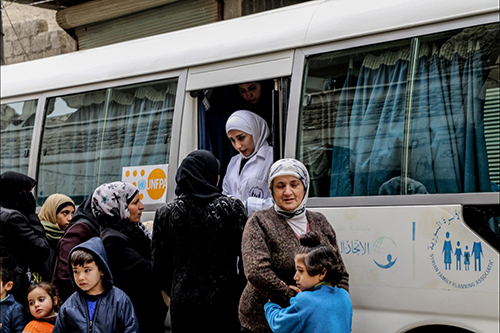 SHEIKH MAQSOUD, Syria – Two mobile reproductive health teams have been deployed to the Sheikh Maqsoud area of Aleppo following the arrival of a UNFPA and Syrian Arab Red Crescent mission on 28 December, the first time a UN agency has entered the area with aid for distribution. There are an estimated 65,000 people in need in Sheikh Maqsoud, the majority of them women, children and elderly persons. This number is expected to change as more displaced families return to the area. An assessment found significant health-care needs, including severely limited reproductive health services. Only one health facility is operational in Sheikh Maqsoud, serving an estimated 50 patients per day – not sufficient to meet local needs, where about 3,000 women are estimated to be pregnant. The existing health facility is poorly equipped, with no capacity to perform Caesarean section operations or other major surgeries. There is no ambulance available to transfer critical cases to hospitals outside Sheikh Maqsoud. Humanitarian responders also noted that most roads are in disrepair and choked with mud, limiting access. The area also lacks an operating electrical system, forcing the community to rely on generators and expensive fuel, when available. 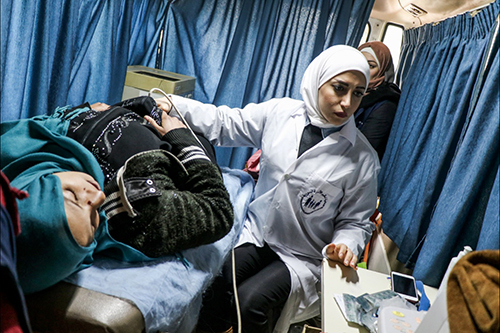 “We at UNFPA in Syria are working to deploy emergency supplies and equipment to make childbirth safer and to support medical interventions,” Mr. Diana said. On 30 December, UNFPA’s mobile reproductive team provided services to over 80 women, reaching those in need of antenatal care, family planning services, postpartum care, and other essential health assistance. Many women had been without care for years. 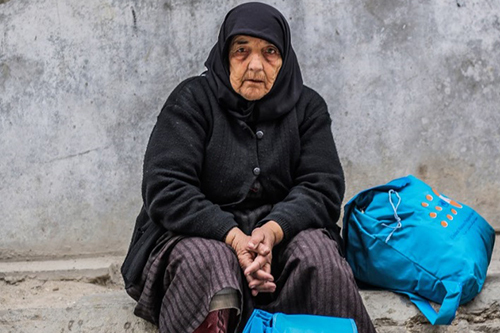 In addition to lacking quality reproductive health care, humanitarian workers observed a large number of people living with disabilities, including wheelchair users, as well as families in desperate need of warm clothing for the winter. UNFPA workers also spoke with local families about challenges to maintaining their children’s education. Despite the shortage of school supplies, parents are determined to keep their children in school. “I’ll make sure that my daughter will finish her education,” one man told UNFPA. UNFPA and its partner, Syrian Arab Red Crescent, distributed 1,200 dignity kits, which contain hygiene supplies such as soap, sanitary napkins and underwear. They are also planning to open three reproductive health centres in the area as soon as possible, which will provide not only reproductive health care but also services for survivors of gender-based violence. UNFPA’s efforts in Sheikh Maqsoud are supported by the European Civil Protection and Humanitarian Aid as well as the governments of Canada, Norway and Sweden.